I saw a colony of these in Seattle's Sound Garden once. There were dozens of them, and they had stuck their mud nests under a metal awning on a building. They were gregarious and in constant flittering motion. 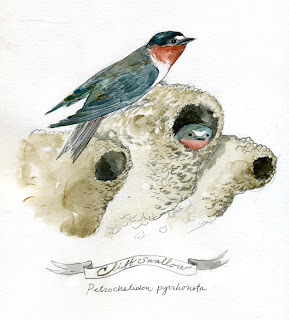 Cliff Swallows are in the genus Petrochelidon which also includes the Cave Swallow. These 2 birds along with barn swallows (genus Hirundo) all create their nests out of mud. Although they can nest solitarily, colonies may range from hundreds to thousands of nests! They breed as far north as Alaska, and winter in South America.